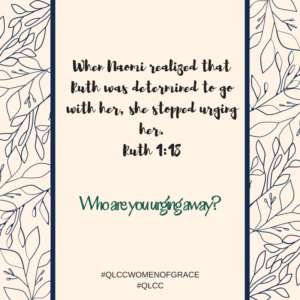 Who Are You Urging Away? Not many of us have been in the situation that Naomi found herself in. Widowed, childless, in a foreign country, and with daughters-in-law to provide for in a world where women were very dependent upon a man for survival. Not only that, but she decides to go home, to travel alone, during a time when “everyone did as they saw fit,” (Judges 21:25). If you’d like to see a rather descriptive example of what that means, read Judges 19. Often times I’ve wondered why Naomi would urge her daughters-in-law away from her. To encourage them back to their families – ok, that makes sense. But back to their gods? Even if she hadn’t brought up their gods, sending them to their families was sending them back to a culture of false gods. But in light of what their journey could have held for them, it’s a bit easier to understand. Horrible dangers faced them either way! And then those thoughts got turned on myself. Who am I urging away? I think I can safely say we all have those people in our lives that we urge away from us. We think we’re being responsible, or sensible, in our actions. We just don’t click. We don’t have the same lifestyle. They don’t really need our friendship. They’d never want to go to church with me. They don’t want to hear what I have to say. And then there’s these: I just don’t have time for another friendship. I’m done investing in relationships that I’m not getting anything out of. There’s an unending list of excuses of why we urge people away from us, but what happens when we do that? Are we not essentially saying, “You’re not worth it”? I’m not saying that we need to be BFFs with everyone, or that we’ll even be friends with everyone. 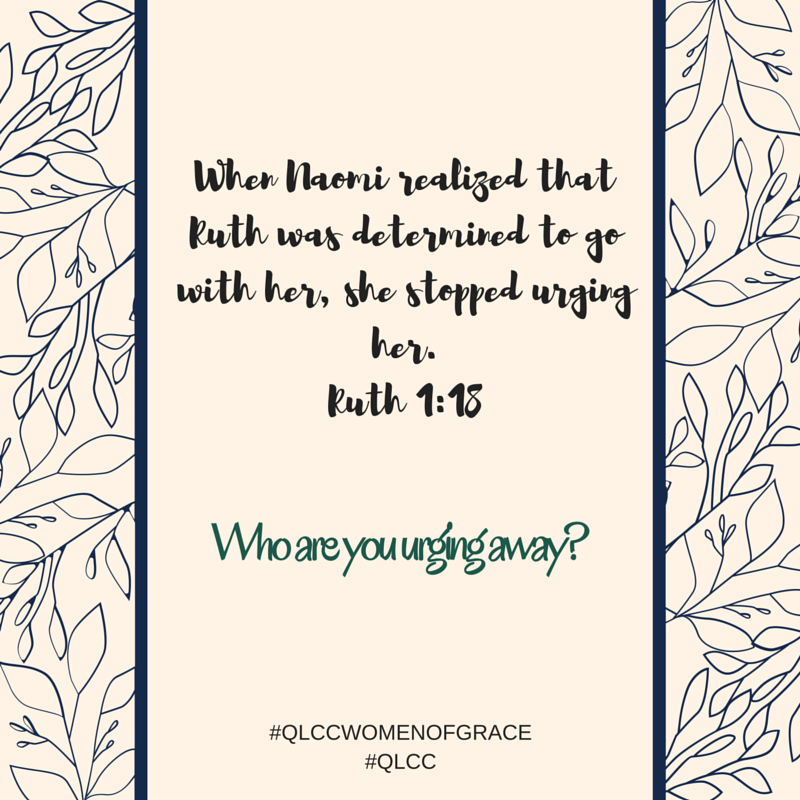 But I am saying, we all have Ruths in our lives, women who have been strategically placed in our lives by God, that we push away because we decide that it’s best. Sisters, I encourage you – and I’m urging myself – to not do what you see fit. Do what Jesus calls us to do: Let’s fulfill the great commission, and let us be the good Samaritan, (Luke 10:25-37). Don’t turn away from ladies who are different, who you think you can’t help or protect. Just invite them to walk with you as you walk to Jesus. That’s all any of us can really do. Jesus will do the rest. Naomi and Ruth’s story journey, and the safety & blessings God gave them, astonishes me entirely. In a world hostile to all things pure and good, they remained safe. Widowed and childless, they were provided for, protected, and Ruth was blessed with Boaz. It all started with a girl willing to leave all she had ever known to stay with her mother-in-law, and a mother-in-law who finally understood she was determined to stay. So let’s be Ruth, and let’s refuse to leave one another. Not just for blessings, not just for friendship, but because salvation could be at hand. Excellent message. Pushing away is easier than urging someone to stay, perhaps w/ issues & unpopular baggage, but at the end of the day the reward is God’s abundant blessings w/ oil that never runs out.